Bringing modern protocols and techniques to vintage computers is a favorite pastime for hackers, and over the years we’ve seen some absolutely incredible hardware and software projects designed specifically to do what most people would consider impossible. They’re very rarely practical projects, of course. But that’s never really the point. The product of 45 minutes of work. 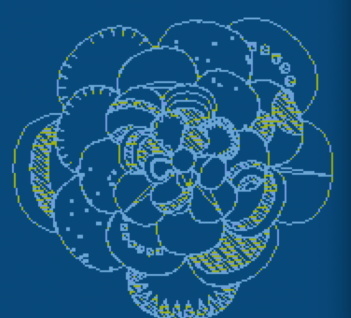 Today we present another excellent entry into this niche avenue of hacking: Renderific, a tool to render SVGs on 8-bit Atari computers by [Kevin Savetz]. The MIT licensed program is written in Turbo-BASIC XL and allows computers such the 1200XL and 800XL to not only render the image on screen but output it to an attached plotter. There are a few niggling issues with some files, and apparently the plotter draws the image upside-down for some reason, but on the whole we can now add “SVG Rendering” to the list of things you can do with a nearly 40-year-old computer. Of course, those who are familiar with these 1980’s machines might wonder how their limited CPUs can possibly cope with such a task. Well, that’s where the impracticality comes in. According to [Kevin], you can be in for quite a wait depending on the complexity of the image. In his tests, some SVGs took up to 45 minutes to fully render on the screen, so you might want to have a snack handy. If you’re interested in lending a hand with the project, it sounds as though [Kevin] could use some assistance in figuring out why the Atari 1020 plotter doesn’t like the output of his program. There’s also a few SVG functions and forms of Bézier curves that need some work if you’ve got your Turbo-BASIC XL programming books handy. Will you ever have a need to view SVG files on an Atari 1200XL? No, probably not. You might not have a desire to play Spotify on the Macintosh SE/30 either, but that hasn’t stopped hackers from figuring out how you can do it. As long as these old machines are still up and running, we’re confident that the community will continue to teach them new tricks. The Atari 2600 is a console from a very different time, when home appliances, furniture, and even automobiles were all covered in fake vinyl woodgrain veneer. Somehow it was the in thing for a decade, and then immediately became tacky overnight. Regardless, if you want to evoke the era, that’s what you do – and that’s exactly what [Christian] did with this handheld RetroPie build. An early concept sketch shows off [Christian]’s art skills. The technical side of things is fairly routine in these parts – a Pi Zero runs RetroPie so you can play emulated games from the mid-90s and earlier. It’s the visual presentation that we particularly enjoy. The look of the early Atari is evoked through clever use of materials. The body is in black plastic, with blocky red buttons for controls. It’s finished with a vinyl woodgrain applique around the screen, and we think it’s a wonderful aesthetic. The files to print your own are available on Thingiverse, and [Christian] has provided a basic guide to sourcing similar parts. It’s all common stuff, readily available on eBay or elsewhere. We love seeing retro throwbacks like this – the tiny Macintosh Plus from the 2017 Superconference is a particular highlight. The Game Genie is a classic of the early 90s video game scene. It’s how you would have beaten the Ninja Turtles game, and it’s why the connector in your NES doesn’t work as it should. They never made a Game Genie for the Atari 2600, though, because by the time the Game Genie was released, the Atari was languishing on the bottom shelves of Toys R Us. Now though, we have FPGAs and development tools. We can build our own. That’s exactly what [Andy] did, and his Game Genie for the 2600 works as well as any commercial product you’d find for this beleaguered console. To understand how to build a Game Genie for an Atari, you first have to understand how a Game Genie works. The hacks for a Game Genie work by replacing a single byte in the ROM of a game. If your lives are stored at memory location 0xDEAD for example, you would just change that byte from 3 (the default) to 255 (because that’s infinite, or something). Combine this with 6-letter and 8-letter codes that denote which byte to change and what to change it to, and you have a Game Genie. 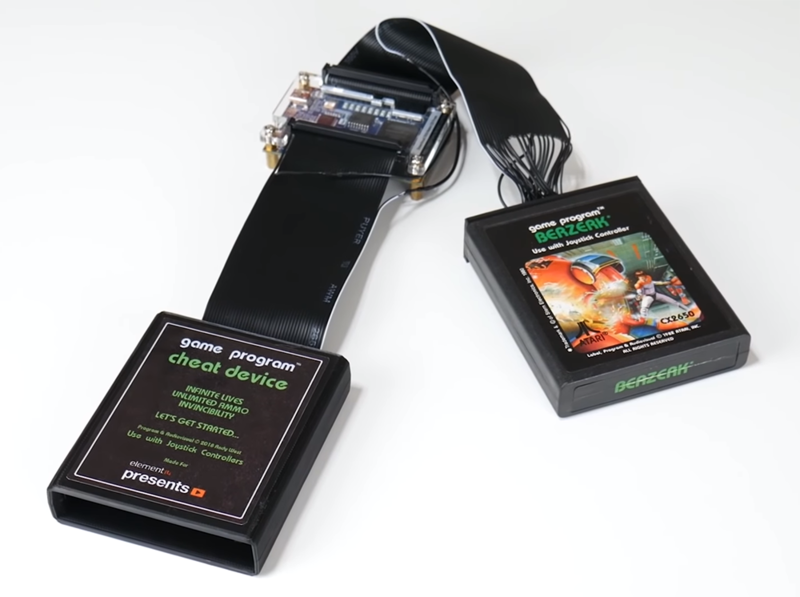 This build began by setting up a DE0 Nano FPGA development board to connect to an Atari 2600 cartridge. Yes, there are voltage level differences, but this can be handled with a few pin assignments. Then, it’s just a matter of writing Verilog to pass all the data from one set of address and data pins to another set of address and data pins. The FPGA becomes a man-in-the-middle attack, if you will. Did the Atari 2600 ever come with a drum machine cartridge? Maybe. Probably not. [John] originally built this project to experiment with the TIA chip, but found it was less tonal than a kazoo. That struck ‘Atari synthesizer’ off the list and replaced it with an ‘Atari drum machine’. There are two key parts of the build here, the first being a repurposed Asteroids cartridge that had the PROM replaced with a ZIF socket. This allows [John] to easily burn new code to an EEPROM, stuff it in the socket, and run it on the Atari. All the code was developed with batari Basic, a BASIC-inspired language that spits out .bin files for the Atari. But running code on the Atari is just one half of this build. To do a drum machine, you somehow need to tell the Atari when to play each sound. Given the lack of expansion capabilities for the Atari, [John] turned to the controller port. The Syndrum uses Arduino Nano to bridge the DE9 controller connector to a MIDI port. Yes, it’s real MIDI, on a machine that could probably never do MIDI natively (although we’d love to see someone try). In the world of retro gaming, when using emulators and non-native hardware it’s pretty common to use whatever USB controller happens to be available. This allows us to get a nostalgic look while using a configurable controller. One thing that isn’t as common is using the original hardware while still finding a way to adapt a modern controller to an old console. This is exactly what you need though, when you’re retro gaming on a platform with notoriously terrible controllers. [Scott] enjoys his Atari 5200 but the non-centering and generically terrible joystick wasn’t well received even in the early 80s when the console was in its prime. He decided that using a Dual Shock controller from a Playstation 2 would provide a much better gaming experience, and set about building an adapter. He found that in a way the Dual Shock controller was an almost perfect pairing for the Atari because it has two analog control sticks built-in already. There’s also an array of information on pairing the Dual Shock controller with AVR microcontrollers, so he wouldn’t have to reinvent the wheel. From there, it was just a matter of pairing communications protocols between the two pieces of hardware. The project page goes into quite a bit of detail on SPI communication protocols and the needs of both the Atari and the Playstation controller. If you’re a retro gaming fan, really into communication protocols, or have always had a love-hate relationship with your Atari because the controllers were just that bad, it’s worth checking out. If this is too much, though, there are other ways to get that Atari nostalgia.